Who should not take Osmoprep? What conditions does Osmoprep treat? Persistent diarrhea or vomiting may result in a serious loss of body water (dehydration) and minerals. This may cause seriousside effects to the kidneys and heart. Contact your doctor promptly if you notice any symptoms of dehydration, such as unusual decreased urination, unusual dry mouth/increased thirst, lack of tears, dizziness/lightheadedness, muscle weakness/cramping, or pale/wrinkled skin. Tell your doctor right away if you have any serious side effects, including: severe or persistent stomach/abdominal pain, black/bloody stools, rectal bleeding, mental/mood changes (such as confusion, unusual drowsiness). Get medical help right away if you have any very serious side effects, including: fast/irregular heartbeat, chest pain, fainting, seizures. List Osmoprep side effects by likelihood and severity. Before using this medication, tell your doctor or pharmacist your medical history, especially of: heart problems (such as heart failure, irregular heartbeat, QT prolongation in the EKG, chest pain, heart attack or heart surgery within the last 3 months), stomach/bowel problems (such as blockage, irritable bowel disease, ulcerative colitis, severe constipation), gastric bypass/stapling, low blood minerals, severe loss of body water (dehydration), kidney problems, liver problems (such as cirrhosis, fluid build-up in the abdomen), salt restricted diet, daily alcohol or sedative use, seizure problem, swallowing problems (such as narrowing of the swallowing tube/esophagus). What should I know regarding pregnancy, nursing and administering Osmoprep to children or the elderly? Some products that may interact with this drug include: drugs that may affect the kidneys (including ACE inhibitors such as lisinopril, ARBs such as valsartan, diuretics/"water pills" such as furosemide/hydrochlorothiazide, NSAIDs such as ibuprofen/naproxen). Sodium phosphate can rarely increase the risk of an abnormal heart rhythm (QT prolongation in the EKG) from certain medications. These drugs include amiodarone, dofetilide, pimozide, procainamide, quinidine, sotalol, macrolide antibiotics (such as erythromycin), among others. QT prolongation can rarely cause a serious (rarely fatal) irregular heartbeat. Consult your doctor or pharmacist for more details and for instructions on how you may minimize the risk of this effect. Does Osmoprep interact with other medications? 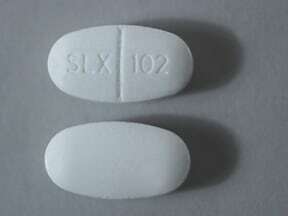 This medicine is a white, oblong, scored, tablet imprinted with "SLX 102". Are you considering switching to Osmoprep? How long have you been taking Osmoprep?